Government agencies have a unique challenge managing their presence on social media. It's not easy to balance a trustworthy and informative presence with a human voice - and maybe some occasional fun. Check out how these government agencies are keeping their audiences informed and engaged with the power of Twitter, Facebook and Instagram. It's one of the most followed government accounts with over 8 million followers. NASA does a great job of interacting with fans, and are a continuous example of how a government social media account should be handled. NASA has helped a new era of citizens stay engaged and interested in space exploration via social media. Mike Jachles serves as the primary PIO for the Department of Fire Rescue and Emergency Services within the Broward County Sheriff’s Office in Florida. Citizens should keep a close eye on his twitter feed for updates to breaking news stories and heartwarming animal rescues. @seosmh @longislandtonv Yes! We already have some biking paths that go from one end of town to the other. 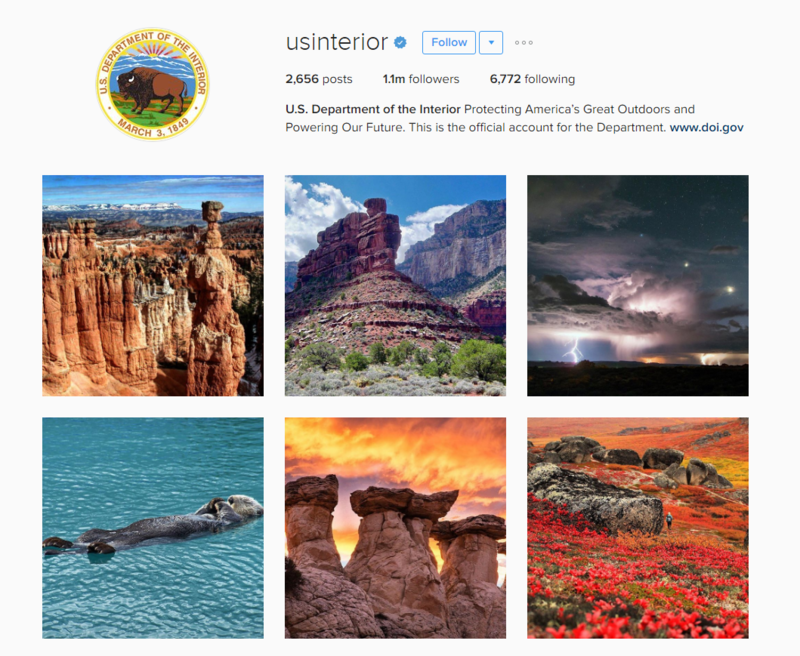 No one shows off the beauty and diversity of America quite like the Department of the Interior. And there's no better place to do it than on Instagram. Don't let the name fool you, prepare youself for truly beautiful landscapes and the thing the internet loves the most... adorable baby animals. Yes, we've included NASA twice. They do such an amazing job that when recounting the best government agencies on social media, it's hard not keep coming back to NASA. Instagram is the perfect way for the agency to share the beauty of space with an entirely new generation of Americans. Before you go rolling your eyes as you remember your last encounter with TSA... get a new look at this government organization through the lense of Instagram. Both entertaining and informative, they regularly post tips and tricks (#TSATravelTips), as well as bizzare and interesting finds (#TSAGoodCatch). FEMA has a great Facebook page, with plenty of preparedness planning checklists. They also do a great job with updates and combining of text and graphics to keep their fans engaged. The City of New York's Facebook page is focused on celebrating stories of hope and inspiration, as well as keeping the citizens informed on the latest across the city.